Seoul Metropolitan Government and the Cultural Heritage Administration unveiled yesterday their plans for a 'New Gwanghwamun Square' by 2021, and they came up with a weird 'solution' for the potential traffic conundrum I mentioned four years ago, when the project started taking a clearer shape (see "Gwanghwamun, Donhwamun, and the Tale of two Royal Roads"). This modification of Seoul's most defining center has potentially even greater consequences than the previous one, which we followed step by step a decade ago. I will as usual focus on the urbanistic impacts (passing by many familiar spots), but since this is also about Korea's center of power ever since its capital was founded, I'd better start with some political context. Such a project deserves to be carried by both the local (SMG) and national (CHA) governments, and PARK Won-soon as well as MOON Jae-in happen to have a special bond with a site where PARK Geun-hye started and ended her presidency. Started? If we all remember the massive, peaceful demonstrations that led to PGH's destitution, who could possibly forget that kitschissime wishtree** on Gwanghwamun Square, her first symbolic stop on her way to Cheong Wa Dae? During his own campaign, MOON Jae-in pledged to move the presidential offices from Cheong Wa Dae to Sejongno, and the presidential residence closer to Gwanghwamun, in order to cleanse the feet of Bugaksan, and to honor the place where democracy took a stand and won. MOON also picked Gwanghwamun Square to celebrate his victory. Retrospectively, I shudder when I remember AHN Hee-jung's over-the-top cheering that night - back then, I didn't know he couldn't even control his darkest pulsions... anyway, his DSK / #metoo moment completely revived the ambitions of a man who tried to steal the show on the very same night. Only weeks ago, PARK Won-soon was clearly out of the game for the 2022 presidential elections, and about to be dumped by his own party for the upcoming mayoral elections (June 2018). Now he's leading the polls by far (against WOO Sang-ho and PARK Young-sun for the primaries, and against AHN Cheol-soo and KIM Moon-soo beyond), and this new project looks like the ideal platform for both ballots: he can make a splash in 2018 on the very site that boosted his predecessor's reelection***, and deliver the goods just months before 2022. Of course, PWS already combined a major urban project with a major political event before, but PGH's impeachment derailed Seoullo 7017's perfect timing ahead of the 2017 elections (see "Seoullo 7017, and more roads to Seoul"). Now is the right moment to communicate a grand scheme and vision, big enough to mask PARK's most recent shortcomings: he barely managed to avoid criticism for Seoul's waste management crisis by sending deputies to face the media, and he let his rival WOO preempt the usually well coveted 'public transportation' territory by campaigning on a new metropolitan authority, including yet another revival of the key Seobuseon project (after 2013, when "Seobu Line confirmed as Seoul's LRT top priority", the city dropped the ball once again). So yes, it's about politics. 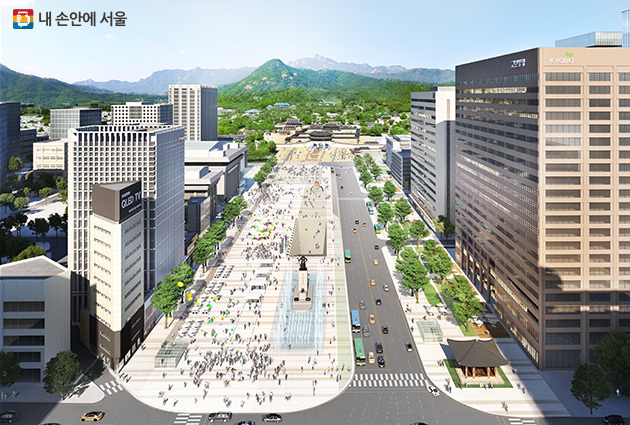 But regardless of this context, Gwanghwamun Square and its surroundings needed a fix. 3.7 times bigger, 3.7 times better? Seoul also revived its old ambition to restore Baekundongcheon, Cheonggyecheon's main source, the diagonal still visible on today's map (see "Baekundongcheon / Gwanghwamun-gil - A River Runs Through It"*****). 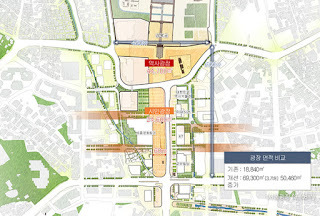 Seoul city advertises about the 3.7 factor by which pedestrian surface booms from 18,840 m2 to 69,300 m2, the reduction of traffic lanes to 6 along Sejong-daero, and its renewed demands to the State for a GTX extension to Gwanghwamun. All this sounds very positive and environment friendly, but no really new green spaces are planned, and the extended square might make Summers and Winters even more merciless in what looks more like Tiananmen Square, or the barren landing site that preceded Yeouido Park. There are still no dedicated lanes for buses or bicycles, and buses shall be redirected South, which seems recipe for disaster for public transportation around downtown Seoul, particularly since the new road map deprives Sajik-ro 8-gil (formerly Naejadong-gil) from its role of main NS/EW dispatcher. Compared to Gwanghwamun 2.0, the 2009 revolution that brought pedestrians back to the heart of the capital, this Gwanghwamun 3.0 adds only marginal change to their experience. I like the idea of restoring the 'parvis' in front of Gwanghwamun, the Eastern pavillions and hanok around a 'History Square' that could liven up the walk from Seochon to Bukchon... but pushing traffic further downtown, and adding new bottlenecks to already saturated axes does seem like a big price to pay. Unfortunately, like with Seoullo, impact surveys have obviously been eluded in a race to meet electoral deadlines, and authorities chose to worsen traffic situations by not tackling them. Even the curve of the new road following the back of the central government building (that by the way shouldn't be on that History Square) tells about quick and dirty fixes without consideration for the big picture. What Seoul needed was a consistent vision and plan to prepare its whole historic center Sadeamun (intra muros) for a driverless future. What Seoul delivered was a dangerously incomplete, short-sighted, ill-prepared PR stunt. The city will take one year to select a proposal, start work in January 2020, and finish by EOY 2021. 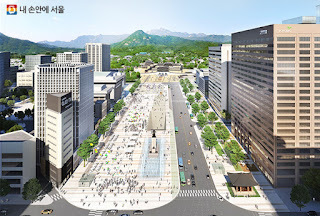 Mayor PARK missed by a few months last time, and 2021 seems safe enough a goal for him to inauguration the new (if not improved) Gwanghwamun Square. I sincerely hope he'll reconsider this plan, and grow some ambition for our city. * see "The Anipang Election: Park wins big, but who won?" ** see "Park 2 Day 1 in pictures"
**** see "Inwangsan's Great Wall and Seoul's Royal "T" Time"
***** note that since my 2009 focus, the streets West of Sejong-daero have been renamed Saemunan-ro 9-gil and Saemunan-ro 5ga-gil. Seoul also renewed the project of highlighting walls around Sajik-dan and Sajik-park.